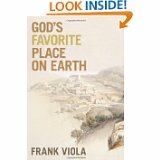 Shortly, I will be receiving a review copy of God’s Favorite Place on Earth by Frank Viola. The book released May 1st and stayed in the top # 50 on Amazon.com for 8 straight days. There’s a lot of buzz about this book on the Web, and I’ll be writing a review after I read it. Here are a few interesting nuggets about the book. * It’s been recommended by 47 Christian authors, including John Ortberg, Jack Hayford, Leonard Sweet, Tricia Goyer, Mary DeMuth, Greg Boyd, Todd Hunter, Jon Acuff, Phil Cooke, and many others. * There is an interesting video trailer for the book that introduces it. * The book tells the story of Jesus in the little village of Bethany and the amazing things that happened there through the eyes of Lazarus. It combines biblical narrative, dramatization, theological insights, and nonfiction devotional teaching. It argues that “Bethany” was God’s Favorite Place on Earth and explains how every Christian and every church can be “Bethanys” today for God. * The book addresses 18 specific struggles that Christians face today and offers hope, challenge, and fresh insight. You can check all of this out at God’s Favorite Place on Earth and get the book on discount. If you find this post helpful, you are free to ADD A LINK to it on your blog or website. But don’t copy and paste the post as this violates Google’s guidelines. Please share your comments here. © Next Generation Ministries. Simple theme. Theme images by Storman. Powered by Blogger.